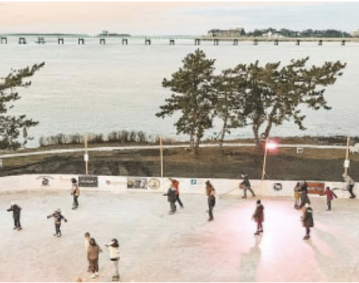 Open through February, guests and locals alike can glide across the ice while taking in unobstructed views of the famed Newport Bridge and Newport Harbor Lighthouse, decorated for the festive season. Programming for locals including College Day, Family Day, and Disco Nights will be scheduled throughout the season. The ice will also be available for Private Parties and Corporate Team Skates. The ice rink at Gurney’s Newport is open daily for guests, visitors and locals from 10 a.m. until 9 p.m. Admission is $7 for adults and skate rentals are $5.